Worship is central to life at All Saints’. The vision that shapes our time together is simple: we focus on God and we leave with a greater sense of hope and joy. Our services are shaped by Episcopal tradition and tailored to be relevant to your daily life and spiritual journey. Inspiring music, meaningful sermons, a welcoming and inclusive atmosphere: these are the things you will find when you join us on a Sunday morning. The 8:00 am service offers worshippers an opportunity to come before God in a quiet/contemplative worship style. The service uses both Rite I and Rite II from the Book of Common Prayer, alternating by liturgical season. The 9:00 am service happens in the Parish Hall and follows the liturgy of Rite II in the prayer book. It is less formal and very family friendly. There is often a children’s sermon offered and the children are invited to gather around the altar for communion. The 11:10 am service is a standard Rite II prayer book service with traditional hymnody and choir with organ accompaniment. This is All Saints’ most attended service and traditional Episcopalians will feel right at home here. The Acolyte ministry is open to children and teens in grades 3-12. They serve at the altar in several roles during the 9:00 and 11:10 services. There is training required for participation in this important and fun ministry. This support ministry offers lay people the opportunity to participate directly in the worship service, assisting the priests at the altar. Lectors and Intercessors bring Scripture and prayer to life through their readings. Chalice Bearers have the privilege of sharing the Lord’s sacramental table with fellow worshipers. The ministry of the Altar Guild provides its members the privilege of coming together each week to enhance the gathering and worship of the Parish. If you enjoy handling beautiful silver, brass, linens and flowers, you would enjoy being a part of this group of men and women. Click here to access the Altar Guild Manual. The Choir of All Saints’ rehearses on Wednesdays at 7:00 PM and leads worship at the traditional service at 11:10 AM on Sundays. The repertoire of this choir includes standards of the Anglican choral tradition from its beginnings through the 21st century as well as music from multicultural genres. This group is warm and welcoming; if you enjoy part-singing and a more traditional style, then come take a seat with us! 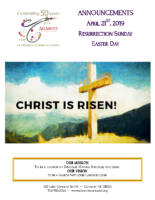 The Resurrection Choir leads worship on Sundays at the 9:00 AM Renewal/Contemporary Service. The repertoire of this choir consists of a blend of Renewal, Folk, and Christian Popular music. If you find yourself being tugged towards the choir on Sunday mornings, please find a seat with the choir and try it out! The Bells of All Saints’ rehearse on Wednesdays at 6:00 PM and play during the 11:10 AM service several times each academic semester. The age range is 9th grade through adulthood. This group is perfect for anyone who is interested in being part of a musical ensemble; even if you don’t sing your bells will always be in tune! To play hand bells well, you only have to learn to read two notes and to count to four. Well, to be honest, sometimes you may have to count to six. This group performs throughout the academic year. If you are interested, please talk to Brian to find out about any openings that may be available. The St. Nicholas Choir, for Grades 1-3, meets on Tuesdays from 5:30-6:00 PM and sings and plays periodically throughout the academic semesters. The Junior Choir of All Saints’, for Grades 4-6, meets on Tuesdays from 6:00-7:00 PM and sings and plays periodically throughout the academic semesters. Both children’s groups learn basic musical education, learn to sing in a healthy way as well as play and accompany themselves with instruments, all carried along with the Orff-Schulwerk process! These groups support worship regularly, and beautifully enhance the worship experience during special programs and services. For more information, contact Brian Sapp-Moore.